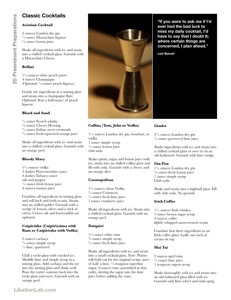 The BarSmarts bartender education and certification program lists the following as 25 classic cocktails that every bartender should know how to make. For a cocktail enthusiast, it’s good knowledge to have for making a lasting impression on the ladies, or for coaching a bartender (who didn’t get the memo) through making your drinks. Shake all ingredients with ice and strain into a chilled cocktail glass. Garnish with a Maraschino Cherry. Gently stir ingredients in a mixing glass and strain into a champagne flute. Optional: float a half-ounce of peach liqueur. Shake all ingredients with ice and strain into a chilled cocktail glass. Garnish with an orange peel. Combine all ingredients in mixing glass and roll back and forth to mix. Strain into an chilled goblet. Garnish with a wedge of lemon, olives and a stick of celery. Celery salt and horseradish are optional. Chill a rocks glass with cracked ice. Muddle lime and simple syrup in a mixing glass. Add cachaça and the ice into the mixing glass and shake well. Pour the entire contents back into the rocks glass and serve. Garnish with an orange peel. Shake spirits, sugar and lemon juice with ice, strain into an chilled collins glass and fill with soda. Garnish with a cherry and an orange slice. Shake all ingredients with ice and strain into a small cocktail glass. Note: Purists will hold out for the original recipe: juice of half a lime, ½ teaspoon superfine sugar, 2-ounces rum (assembled in that order, stirring the sugar into the lime juice before adding the rum). Shake ingredients well with ice and strain into a chilled martini glass or serve over ice in an old fashioned glass. Garnish with a lime wedge. Shake and strain into a highball glass. Fill with club soda. No garnish. Combine whiskey, coffee and syrup in an Irish coffee glass. Ladle one inch of cream on top. Shake thoroughly with ice and strain into an old fashioned glass filled with ice. Garnish with a lime wheel, a mint sprig and, if possible, a sonya orchid. Pour all ingredients over ice in a mixing glass and stir. Strain into a chilled cocktail glass. Garnish with a cherry or a twist. You may substitute dry vermouth for a dry Manhattan with a lemon peel garnish, or half sweet and half dry for a “perfect” Manhattan. Combine first three ingredients in a mixing glass with ice. Shake well and strain into a chilled, salted cocktail glass. Stir all ingredients with ice to chill and twist orange or lemon peel over the top. Substitute sweet vermouth for dry and you have a Martinez. Prepare a tall mixing glass with ice. Pour vermouth over ice and swirl to season, then strain vermouth off the ice. Pour gin or vodka over seasoned ice and stir to chill. Strain into a chilled martini glass. Garnish with an olive. Gently bruise one sprig of mint in the bottom of a highball glass with simple syrup. Add half of the bourbon and half fill with crushed ice. Swirl with a barspoon until the outside of the glass frosts. Add more crushed ice and the remaining bourbon and stir again. Garnish with a sprig of mint. In a tall mixing glass muddle mint leaves with simple syrup. Add lime juice and rum and fill with ice. Shake vigorously and strain over fresh ice into a highball glass. Top with soda and garnish with a sprig of mint. Combine all ingredients in an chilled old fashioned glass and stir. Garnish with an orange peel. Top with an ounce or two of soda or serve straight up, in which case it should be stirred with ice and strained into a chilled cocktail glass. Carefully muddle the sugar, Angostura, one orange, one cherry, and a splash of soda in the bottom of an old fashioned glass. Remove the orange rind and add bourbon, ice, and soda. Garnish with a fresh orange slice and a cherry. Note: The old-fashioned Old Fashioned recipe omits the fruit. Simply muddle the sugar and bitters in a splash of soda until the sugar is dissolved, forming a syrup. Add the whiskey and the ice, and stir. Garnish with a lemon twist. Shake all ingredients with ice and strain into a small cocktail glass. Garnish with several drops of Angostura Bitters on top of the foam. Chill one rocks glass while preparing the drink in another. Splash the Herbsaint into the second glass, swirl it, then pour it out. Add rye, syrup, and bitters and stir with ice to chill. Strain into the chilled rocks glass and garnish with a lemon peel. Shake all ingredients with ice and strain into a chilled old fashioned glass or cocktail glass. Garnish with an orange peel. Note: If served “up” strain into a small cocktail glass with a sugared rim. Shake both ingredients with ice and strain into an old fashioned glass filled with crushed ice or serve up in a chilled cocktail glass. Note that this is an exception to the rule that drinks with only liquors and liqueur should be stirred. Shake all ingredients with ice and strain into an old-fashioned glass or a special sour glass. Garnish with an orange slice and a cherry speared on a cocktail pick (known as a flag). Wow, that is thorough. I’m keeping this on my refrigerator. I suppose I could be considered a master bartender. Most of the lists I see are not what the top 10 drinks are. Vodka tonic is still no 1 from nyc to beverly hills. white wine screw driver maggie long island vodka marty cosmo bl mary jack rocks dewars water, jonny red and black rocks white russian perfevt rob roy people 85 may order 1 or a perfect one I know another 75 and many are variations on the basics. Being a bartender when I train new people always use the ice scoop, you break a glass in the ice your gone, that has to be removed and drained. When you work can often dictate how and what are the popular drinks. regional drinks do exist. and there,s always some new drinks. weat coast uses blenders as a shaker. you really have to be a multi tasker to work with people 5 deep for 2 solid hours and well stocked. You,ll become a waste case if you drink on duty, there no job that you should be drinking at.